We had Christmas dominating our our 'Festive Fun' bakes for December. Remember though that cake is for life and not just for Christmas! If you want to check out some recipes for gingerbread, Bundt cakes and other yummy delights take a look at the round up here. By now your bins should be overflowing with packaging and groaning with bottles. 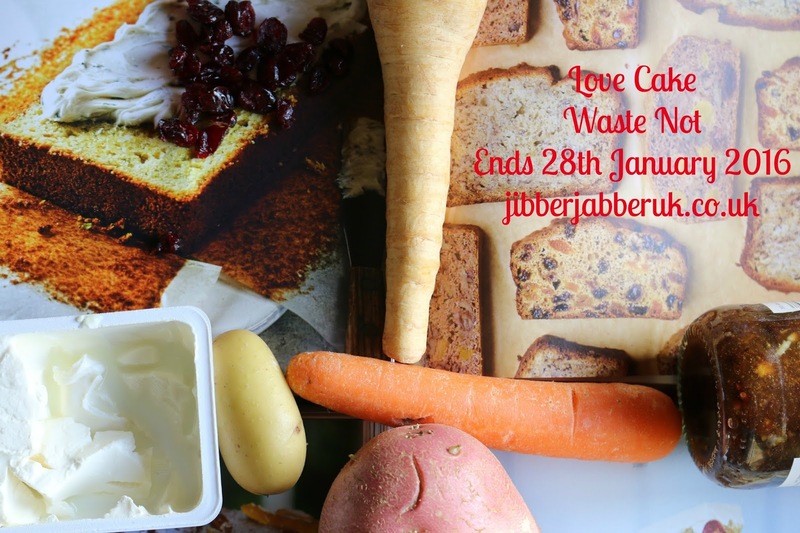 A quick look through the cupboards and fridge and you'll find half used jars of mincemeat, jam and other preserves, open packets of dried fruit and nuts plus tubs of cream, yogurt and cream cheese. In the vegetable rack there's probably a few sad looking carrots, parsnips and potatoes. It's time to have a New Year clean up without chucking out perfectly good, edible food. Therefore the theme for this month is WASTE NOT. 1. Please make sure your entry conforms to this month's theme of WASTE NOT. 3. Enter the URL (web address) of your post into the Linky at the bottom of this post. Once the link closes on Thursday 28th January 2016 at 23:55 no more entries will be accepted. Yep..... Good theme! Got just the cake!